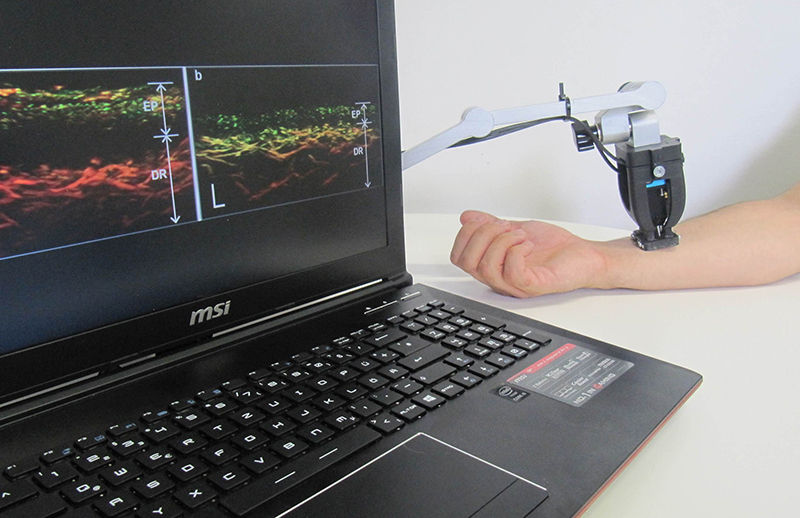 A newly developed tissue scanner allows looking under the skin of psoriasis patients. This provides clinically relevant information, such as the structure of skin layers and blood vessels, without the need for contrast agents or radiation exposure. A team of researchers from Helmholtz Zentrum München and the Technical University of Munich (TUM) recently introduced the technology in ‘Nature Biomedical Engineering’. While developing the method, the scientists were able to reduce the size of the scanner to a handheld device. “This technology, which is easy to use and does not involve any radiation exposure or contrast agent, is allowing us to acquire the first new insights into the disease mechanisms. It also facilitates treatment decisions for the physicians,” explains Prof. Dr. Vasilis Ntziachristos, Director of the IBMI at the Helmholtz Zentrum München and Chair of Biological Imaging at the Technical University of Munich. In the recently published study, the scientists demonstrated RSOM’s performance by examining cutaneous and subcutaneous tissue from psoriasis patients. RSOM allowed them to determine several characteristics of psoriasis and inflammation, including skin thickness, capillary density, number of vessels, and total blood volume in the skin. They compiled these to define a novel clinical index*** for assessing psoriasis severity that may be superior to the current clinical standard because the new index also takes into account characteristics below the skin surface. *Psoriasis treatment depends on the severity of the disease and possible organ involvement, which the new technique can help assess in a non-invasive way, obtaining information that before could only be retrieved with painful, invasive biopsy. **RSOM stands for raster-scan optoacoustic mesoscopy. Technical University of Munich (TUM) is one of Europe’s leading research universities, with more than 500 professors, around 10,000 academic and non-academic staff, and 39,000 students. Its focus areas are the engineering sciences, natural sciences, life sciences and medicine, reinforced by schools of management and education. TUM acts as an entrepreneurial university that promotes talents and creates value for society. In that it profits from having strong partners in science and industry. It is represented worldwide with a campus in Singapore as well as offices in Beijing, Brussels, Cairo, Mumbai, San Francisco, and São Paulo. Nobel Prize winners and inventors such as Rudolf Diesel, Carl von Linde, and Rudolf Mößbauer have done research at TUM. In 2006 and 2012 it won recognition as a German “Excellence University.” In international rankings, TUM regularly places among the best universities in Germany.